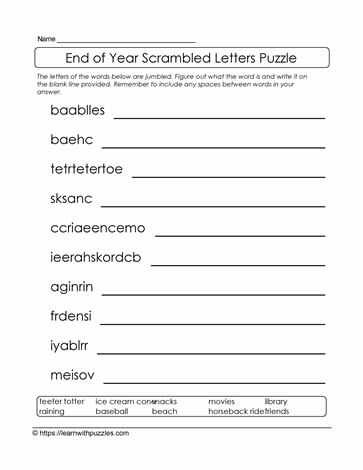 This jumbled letters puzzle for the end of the school year is sure to keep kids engaged as the academic year winds down They use knowledge of vocabulary related to end of the year and knowledge of letter and word patterns to unscramble the letters to solve the puzzle. Some answers may have more than one word. Remember to include spaces in the solution.